Leading utilities in various countries around the world are experimenting with blockchain energy distributed ledger and trading systems in a bid to stay ahead of the technological curve and adapt to rapidly shifting market and regulatory environments. The rapid rise of “behind the meter” solar and other renewable energy resources and battery-based energy storage systems is fueling the trend, which continues even as concerns regarding the highly touted efficiency and security of peer-to-peer (P2P) blockchain trading systems mounts. As reported here on Solar Magazine, Israel-based Solar DAO kicked off an initial coin offering (ICO) of its SDAO digital token cryptocurrency on July 27. Billed as the world’s first wholly digital, autonomous closed-end utility-scale solar project investment fund, Solar DAO originally planned on offering as many as 80 million SDAO tokens at a pre-set price of USD1.00 each in two stages: the preliminary ICO that closed Aug. 31 and a second, primary ICO slated for the end of October. That plan has changed, as Solar DAO founder and CEO Dmitriy Solodukha explained in an interview. 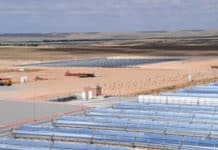 a 250 kW project in Israel budgeted at USD40,000. Solar DAO’s founders have closed the digital smart contracts that result in the creation of new SDAO tokens, effectively eliminating the ability to create new shares in the Solar DAO closed-end investment fund. SDAO investors bought a combined total of 1,172,767 SDAOs with a USD1.00 face value during the pre-ICO. They have been trading as high as USD2.50 on cryptocurrency exchanges, but on average they have been trading within the USD1.20-1.30 range, according to Solodukha. 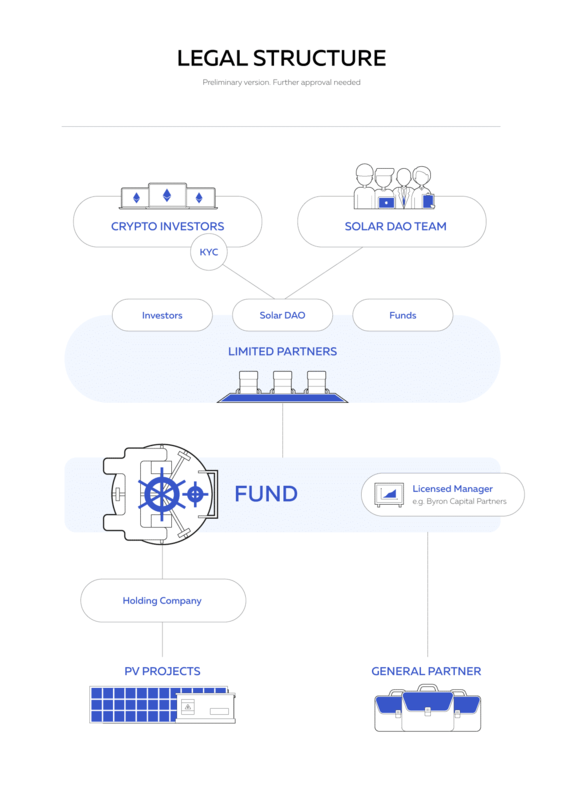 Solar DAO’s founders are working with various, undisclosed engineering companies and financial advisers to carry out its initial slate of projects. They are also in discussions with equipment producers and distributors; engineering, procurement and construction (EPC) contractors and services providers. 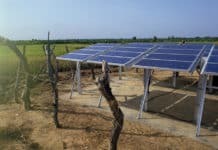 Project finance for Solar DAO’s initial three projects is being structured so that equity investors put up 10-20 percent of the required capital. The remaining, large majority of financing – 80 percent – will take the form of debt. Solar DAO’s equity shares are being put up as collateral to secure financing, Solodukha explained. Solar DAO’s management team expects the first projects will power up and come online this summer. Ethereum’s own cryptocurrency, Ether, has proved especially popular with investors, ranking either second or third in terms of market value and transaction volume. Furthermore, Ethereum, in contrast to Bitcoin, is a full-blown blockchain systems development platform. Hence, it has emerged as a platform of choice for those looking to create not only new cryptocurrencies, but digital autonomous organizations (DAOs) and commercial ecosystems. That makes Ethereum and derivative blockchain trading systems and cryptocurrencies a particularly attractive target for crypto and cyber criminals. The risks involved in carrying out an ICO and laying the foundation for a sustainable business based on a DAO are likely to have figured into Solar DAO’s founding members decision to call off the primary ICO. Mitigating those risks continue to be at the forefront of Solar DAO’s agenda. Furthermore, Solodukha pointed out that there aren’t any Solar DAO smart contracts to hack given the founders have shut them down and they are not, and will not be, running any ICO or token sales. Solar DAO is taking a new, additional step to enhance the security and maintain the value and integrity of the organization, its SDAO cryptocurrency and its projects as well: it is carrying out a “Know Your Customer” (KYC) process. Carrying out a KYC process is an increasingly common occurrence among blockchain-based trading and cryptocurrency developers, according to Solodukha. Requiring cryptocurrency investors to file authenticated proof of identity, not to mention addresses, runs contrary to one of the fundamental tenets espoused by systems developers and investors, however – anonymity. We know not everyone is happy about KYC and some people don’t agree with it ideologically, especially when it comes to cryptocurrencies, where transfers are anonymous, or at least pseudo anonymous. However, for Datum to be a legitimate partner to public bodies and large companies — or even just to our bank — we need to be sure that the sources of all funds raised in the Datum token sale are legitimate. No funds can come from illicit sources, people under sanctions, or organizations with terroristic links. As for Solar DAO, the founding members view the KYC process, along with other steps they are taking to mitigate the risks and uncertainty associated with blockchains and cryptocurrencies, paves the way forward for Solar DAO to create a new private equity fund. Nonetheless, you might well think that banks and other mainstream project lenders would shy away from participating in the financing of projects proposed by a developer whose initial capital base consists of an obscure, newly minted cryptocurrency. Then there’s the “shady” nature and largely unregulated status of cryptocurrencies to begin with, as well as the vertigo-inducing gyrations in the value of Bitcoin, Ether and other of the most popular cryptocurrencies. Not necessarily the case, according to Solodukha. Solar DAO does not see any real reason banks and other mainstream project finance lenders would not participate in financing Solar DAO projects. 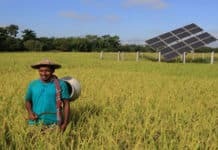 Management has a proven track record of success completing, as well as operating, utility scale PV projects, and, in most cases, in the same countries in which Solar DAO intends to develop projects. Furthermore, “since the very beginning SDAO tokens have been priced in US dollars, not Ether or other cryptocurrencies. That helps us to get rid out of high volatility problem. 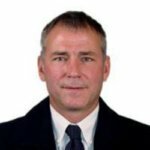 We have always considered Ether simply as a funding machine and nothing more,” Solodukha explained. The changes we are making are to with business processes and regulatory compliance. We still have the same, strong will to implement this project the way we [originally] thought.